copyright 2005, all rights reserved. 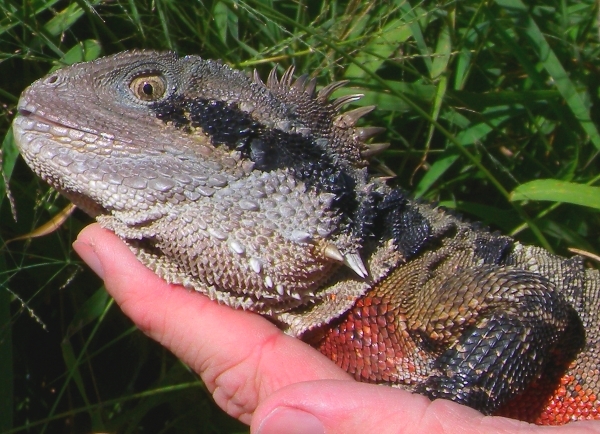 Also known as the Eastern Water Dragon, Aussie Water Dragon and the Brown Water Dragon, formerly placed in the genus Physignathus along with the Chinese water dragon, but have recently been moved to their own monotypic genus and now scientifically known as (Intellagama lesueurii ). Babies are ready to ship from these magnificent creatures made famous by the late great Bert Langerwerf. I handpicked 2 nice breeding groups from his Alabama farm and am looking forward to continuing the breeding success of these beautiful creatures in the U.S. pet trade. 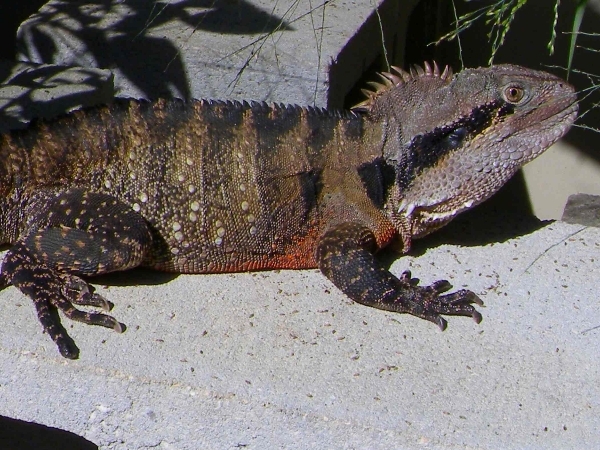 Care for the Australian Water Dragon is quite similar to that of Hydrosaurus species, they are not as prone to rubbing their snouts, but I still recommend a barrier wall for privacy. Males typically reach 30"-36" therefore the cage dimensions for an adult pair could be somewhere in the margins of a 4'x2.5'x3' with several hides for privacy. They do like to climb, but cage height is not as important as it is for Sailfin Dragons and Frilled Dragons. 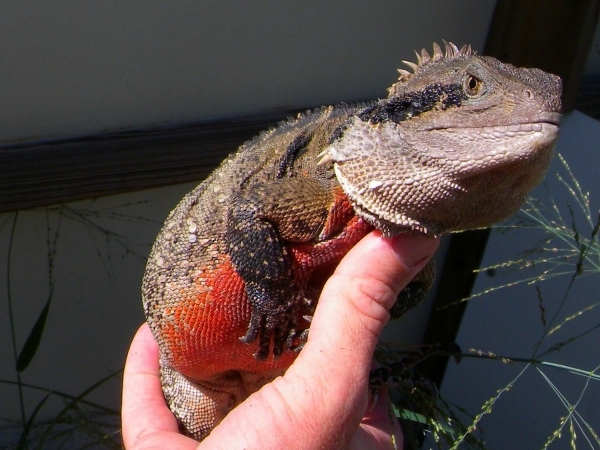 Their diet is primarily insectivorous/carnivorous but will definitely appreciate the occasional fruits and salad mixtures that we offer to our Sailfin Dragons. 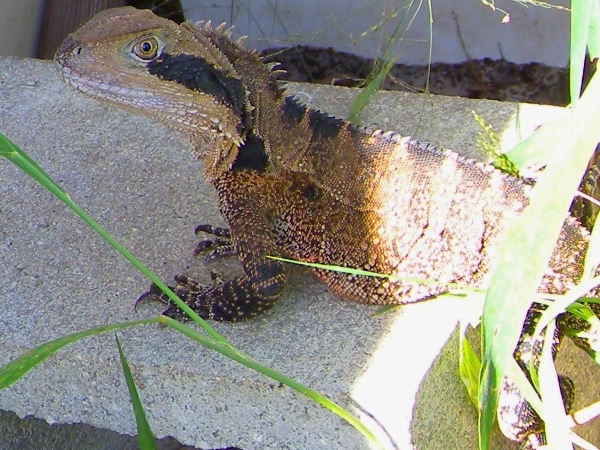 We keep Australian Water Dragons outside year round as they need a natural cool down cycle in order to stimulate breeding activity in the spring. Daytime highs here in the summer reach 90-100F and our winters can drop down to 25F. When keeping indoors ambient temps 85-95F with a 110F basking area. Should I name her Triscuit??? Nice breeder mama! Biscuit showing his pretty array of spikes.